We value your feedback and reviews, which help us maintain a high standard of service. If you have used any of our services, please leave us a review in any one of the platforms below. … thank you for all your hard work and assistance in dealing with my late husband’s claim. From day one you have kept me updated constantly, and have acted in a very professional, efficient and caring way. Your knowledge and expertise is outstanding and I will definitely be recommending Wrigley Claydon in the future. We engaged with Mr Shalish Mehta around October 2013 to advise us on a matter we had with NatWest bank. He was the most professional, compassionate, helpful and kind solicitor we could have wished for. He reassured us at a time when the bank was being very threatening towards us. He advised us how to proceed and with the advice of a Barrister he recommended, we finally came to an agreement to pay back the money we owed to the bank without the threat of losing our home. We cannot thank him enough for what he has done for us; we would have no hesitation in recommending him to friends or family who may need his help in the future. The staff at the Todmorden office has always been very kind and friendly. We engaged with Mr Shalish Mehta around October 2013 to advise us on a matter we had with NatWest bank. He was the most professional, compassionate, helpful and kind solicitor we could have wished for. He reassured us at a time when the bank was being very threatening towards us. He advised us how to proceed and with the advice of a Barrister he recommended, we finally came to an agreement to pay back the money we owed to the bank without the threat of losing our home. We cannot thank him enough for what he has done for us; we would have no hesitation in recommending him to friends or family who may need his help in the future. 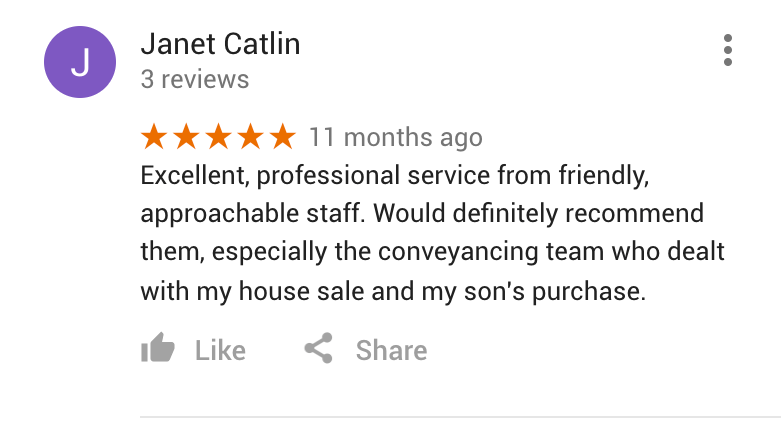 The staff at the Todmorden office has always been very kind and friendly. Thank you once again. Please accept from the family of my late mother our thanks for the professional and sympathetic way in which you have dealt with the estate so far. It has been much appreciated by us all. Thank you for all your help at this difficult time. You have lifted a great weight off our shoulders. We wouldn't hesitate recommending Wrigley Claydon to our friends and family. Thank you for all your help at this difficult time. You have lifted a great weight off our shoulders. We wouldn't hesitate recommending Wrigley Claydon to our friends and family. ... the successful outcome was well beyond our expectations. ... communication was first class, always clear, friendly and left me with no doubts about where we were. I felt that I was kept fully informed at all stages of the claim. ... the successful outcome was well beyond our expectations. ... communication was first class, always clear, friendly and left me with no doubts about where we were. I felt that I was kept fully informed at all stages of the claim. I have worked in partnership with Shalish Mehta for approximately 10 years. Shalish is an efficient and professional individual who has always been dedicated and determined to complete the tasks that my company have engaged his services. He is always available to answer any questions that I may have in a way that is clear to understand. Shalish uses user-friendly forms to gather basic information and verbally confirms to clarify the facts. His communication skills are clear and confident keeping me well informed of the progress being made on the case. Shalish is always successful at claiming money back on the company's behalf. Once I have passed my notes onto Shalish he completely takes charge of the facts. His experience gives me great confidence. He has had different issues to deal with on behalf of our company, all very different and he has approached them all very enthusiastically and professionally. I would recommend Shalish Mehta and Wrigley Claydon to any individual or company requiring services to collect outstanding payments. His expertise in the field of debt recuperation is exceptional. His service is an asset to support any company. I have worked in partnership with Shalish Mehta for approximately 10 years. Shalish is an efficient and professional individual who has always been dedicated and determined to complete the tasks that my company have engaged his services. He is always available to answer any questions that I may have in a way that is clear to understand. Shalish uses user-friendly forms to gather basic information and verbally confirms to clarify the facts. His communication skills are clear and confident keeping me well informed of the progress being made on the case. Shalish is always successful at claiming money back on the company's behalf. Once I have passed my notes onto Shalish he completely takes charge of the facts. His experience gives me great confidence. He has had different issues to deal with on behalf of our company, all very different and he has approached them all very enthusiastically and professionally. I would recommend Shalish Mehta and Wrigley Claydon to any individual or company requiring services to collect outstanding payments. His expertise in the field of debt recuperation is exceptional. His service is an asset to support any company. We were very happy with the help, advice and service we received from our solicitor Jyoti in the Wills & Probate department at Wrigley Claydon. We will certainly recommend Jyoti and Wrigley Claydon in the future.